Bryan Caplan has written an iconoclastic book, defying some of the deeply-embedded assumptions about education as a desirable social good. He attacks education and the educational system from multiple fronts. Caplan’s attack on a college education is even harder. A college education is mostly “signaling”—a sort of showing-off or feathering the cap. Three chapters of the book review and assail signaling, a controversial concept the economists developed in the 1970s, to mow down the great social, moral, political, economic, and spiritual expectations attached to higher education. College education, contends Caplan, does not improve individual or social harmony, political decision-making, moral intuitions, or spiritual wellbeing. It does not even enlarge the economic pie. Given the low benefits of a college education, Caplan opposes to subsidize college studies with grants or government-sponsored loans. In fact, Caplan proposes to tax higher education, much like luxury products and services. Caplan bolsters the attack on education with academic research, data, tables, and graphs. Eighty-five pages of the book are allocated to endnotes and references, pinpointing and sourcing the claims made in the book. The author’s own research is minimal. The research relied upon is done by others. The book is a sort of meta-analysis or literature review, which builds its thesis upon previously conducted multiple studies in the fields of education, psychology, sociology, and economics. Despite its roots in “boring” academic literature, Caplan’s book bears a pleasantly easygoing language. At times, the central thesis of the book is discomforting as it cuts deep into our closely held but frequently unexamined beliefs about the inherent goodness of education. There, Caplan is generous (strategic) enough to offer a few research-based allowances or personal anecdotes to appease otherwise infuriated readers. As compared to high school dropouts, for example, the high school graduates are less likely to commit crime restores the reader’s faith in K–12 education. Such concessions offer temporary relief and prepare the reader to bear the next stabbing on education. Likewise, poor families that cannot afford to send their kids to expensive pedigree colleges will welcome the suggestion that if “your state’s best public school admits you, there’s no solid reason to pay more.” This suggestion, however, is valid only for “excellent students from poor families.” Academically poor or even fair students have no business thinking about wasting time and money seeking a college education. After teaching the law of human rights for nearly 35 years, I find Caplan’s attack on education problematic as it runs against the expressed wisdom of the peoples of the world. The Universal Declaration of Human Rights (1948) declares that everyone has the right to education and that education shall be directed to the full development of human personality. Other human rights covenants require free high school education. Even a highly subsidized college education is within the purview of human rights. The right to education for all, without any discrimination based on race, gender, social status, or national origin is incorporated in many state and nation-state constitutions. Such arguments, however, do not impress Caplan. For him, going against the grain and received wisdom is the source of creativity and fresh knowledge. That is true, though not always. But what Caplan believes to be a contrarian thesis of education is actually a discarded notion of historical prejudice. The attack on universal education is as old as human history. Over the centuries, theories have been articulated to refuse universal education to all. Education has been denied to slaves, women, and the low-caste Hindus. The Taliban in Afghanistan blow up schools to express their displeasure for educating girls. Aristotle argued that nature designs some individuals for manual labor, others for seeking intellect. German phrenologists tied the quality of intellect to the shape of skulls. Southern apologists for slavery argued that blacks are by race intellectually inferior. The authors of The Bell Curve argued that certain ethnic groups are smarter than others. Not too long ago, the President of Harvard University stated that women are inherently ill-equipped to study mathematics and physics. Caplan believes that education ought to be a precious asset available only to a few, such as the Brahmans in India. A diamond ring as a wedding gift is precious, Caplan argues because not everyone can afford it. As an economist, Caplan is correct in believing that an oversupply of a commodity cheapens the “value” of a commodity as everyone can afford to buy it. Only what is rare is precious. Is this true about oxygen, too? Under the oversupply argument, Caplan is not against education or diamond rings per se. He is against their free availability to all. He does not seem to oppose basic literacy or numeracy or vocational skills such as plumbing and hairdressing. A vigorous labor market of ditch-diggers, electricians, garbage collectors, janitors, cooks, masseuses, and comfort-providers is perfectly fine. All this is good for the economy. But an equally vigorous intellectual market needs to be discouraged. It must be carefully cultivated. Thus, Caplan is only opposed to subsidizing college education at the graduate and post-graduate levels. Caplan does not discuss professional education, such as law and medicine because a college education is a pre-requisite for many professional studies. If access to college is restricted, access to professional schools will be automatically restricted. Like most fascinating authors, Caplan, too, has scrumptious contradictions. For example, he criticizes high school curriculum pointing out that what good is teaching Shakespeare to students. However, his final chapter of the book, called Conclusion, begins with a quotation from Shakespeare “For I have neither wit, nor words, nor worth . . .” If Caplan, an economist, finds self-deprecating humor in quoting from Julius Caesar, maybe a high school dropout-turned-plumber would find humor in whispering “Wisely and slow; they stumble that run fast” from Romeo and Juliet. Caplan concludes: “Though high school pays well for almost everyone, the average person shouldn’t go to college. 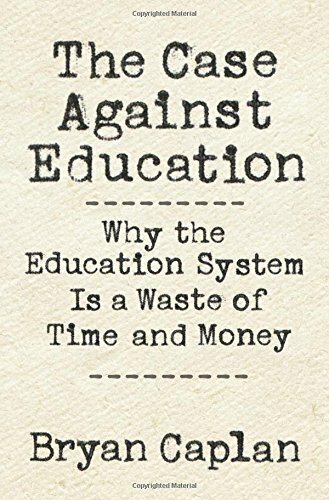 Indeed, the average college student shouldn’t go to college.” Whatever the truth is, this book is recommended to parents, high school teachers, and college professors for gaining valuable insights into the dynamics of “useless” education. The reader is under no obligation, and no reader ever is, to agree with the author.